"Major Barbara," the somewhat comic, very talky play by George Bernard Shaw, is all about money, morality and munitions, subjects that never go out of style. To frame those issues, Shaw sets up Major Barbara, a Salvation Army leader, against her estranged father, Andrew Undershaft, a wealthy arms manufacturer. Barbara's mission may be forced to close if they don't get a quick infusion of cash. Barbara's father is happy to offer that cash. But is it morally acceptable for a true believer to take money from someone who made that money off death and destruction? Which is more virtuous, giving food to homeless people in the hopes of converting them to your religion, or giving them jobs when those jobs involve making guns and ammo? Underlining the timeliness of the play's moral conundrum, director Sandra Zielinski gives "Major Barbara" a current setting in her production for ISU's Westhoff Theatre, including updating Shaw's sturdy prose to add references to NATO and Glock pistols and making Barbara's dad a billionaire instead of a mere millionaire. Eric Moslow's scenic design moves from a traditional upper-crust drawing room that could suit 1910 or 2010 to a streamlined factory piled with boxes. The costumes, designed by kClare Kemock, also mix vintage and new, and the snappy pieces on young socialite Sarah wouldn't look out of place on "Project Runway." Still, Shaw's voice isn't a 21st Century voice. His arguments don't really seem modern even with oil substituted for gunpowder as the currency of the day, and the long, didactic speeches he gave Andrew Undershaft to enlighten us all on the righteousness of capitalism and war are not very compelling. Nonetheless, Zielinksi's cast adds energy and spark to the text, and the scenes at Barbara's mission especially stand out, with good work from Tommy Malouf, Brynne Barnard, Jonathan Oleksinki and Frank Huber as members of the underclass caught up in the struggle between Barbara and her dad. On the other side of the class divide, Tori Allen, Eliza Morris and Brody Murray are properly posh and silly as Barbara's mom, sister and brother, while Kate McDermott is lovely and strong as the idealistic Major herself. The role of Barbara's fiance, a professor of Greek named Adolphus, is tricky, since his motives and arguments are somewhat confusing, but Mitch Conti does a nice job negotiating the gray areas. I still don't exactly understand Adolphus or why he decides what he decides, but Conti made the journey fun, anyway. Mike Gamache has the right plummy voice to make Andrew Undershaft, the antagonist of both Barbara and Adolphus, sound convincing, but Gamache also has a very youthful presence that works against his credibility as a powerful, self-satisfied patriarch. That's always the danger of college productions, with 20-somethings stepping into roles better suited to 60-somethings, and in this case, Gamache is also fighting all those words Shaw piled on top of each other for his alter ego. It's hard to make that kind of bloviation work even if you're Robert Morley, Charles Laughton, David Warner or Simon Russell Beale, who've all played the elder Mr. Undershaft. 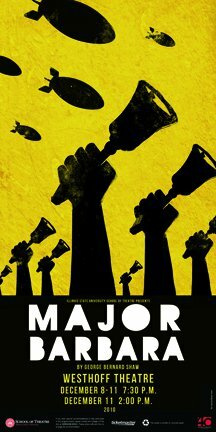 In the end, this is a polished, handsome production of "Major Barbara," making the most of Westhoff Theatre's intimate space. Cast includes: Kate McDermott, Mike Gamache, Mitch Conti, Tori Allen, Brody Murray, Eliza Morris, Zack Powell, Tommy Malouf, Brynne Barnard, Jonathan Oleksinski, Frank Huber, Jessie Swiech, Caitlin Boho, Joey Fitzpatrick. Wow, that IS timely. I had forgotten how exactly perfect it is for now...other than the Shavian thing.